Tim Harrison (left) is the Bristol ChemLabS Director of Outreach, School of Chemistry, University of Bristol, UK. 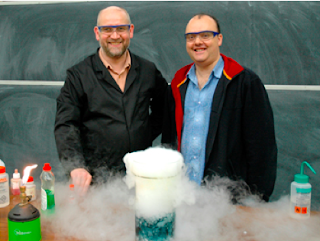 Professor Dudley Shallcross (right)is the Professor of Atmospheric Chemistry, Atmospheric Chemistry Research Group (ACRG), School of Chemistry University of Bristol. Many people confuse weather and the climate. In simple terms the weather is a description of the meteorology of the current air temperature, pressure and the amount of water in the air over a small area such as a town or city. The climate is the air temperature and the amount of water in that air sample measured over a very large area such as Western Europe over a 30-year average. The Earth gets the vast majority of its heat energy from the Sun. The incoming radiation from the Sun arrives at the surface of the Earth and may be absorbed therefore warming up the planet. This energy must eventually be retransmitted to space otherwise the Earth will just get hotter and hotter. The role played by Greenhouse Gases (carbon dioxide, methane, nitrogen oxides and water vapour) and pollutants in our atmosphere in relation to climate needs to be more clearly understood. If a simple physics calculation on the energy received by the Earth from the Sun, (treating the Sun as a black body radiation source) and based on the distance that the Earth is from the Sun the average Earth temperature would be around 10 oC. This is close to the actual temperature of around 16 ºC. Figure 1: Granny stays as warm as she would like, too close, too hot! How can we understand the role of Greenhouse Gases in Climate change? Consider a granny (grandmother) trying to keep warm (figure 1). All grannies around the world may not knit but they are all intelligent and do know where to sit in relation to the fire to keep warm; too close they get too hot, too far away they get too cold. The granny is in the Goldilocks’ Position where everything is just right. The Earth behaves like a granny in that it is just the right distance from the Sun to keep warm, and importantly to have water in the liquid state over most of the planet so that life can exist. However this is too simple a model. The Earth’s snow and ice sheets, and the top of clouds scatters back to space approximately 30 % of the incoming solar energy. The result (figure 2) is the equivalent of an animal or small child getting between the granny and the heater. Granny is now cooler as she is not getting all the warmth from the heater. 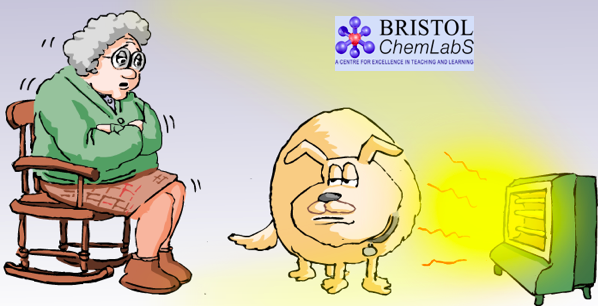 Figure 2: A dog gets between Granny and the fire and blocks some of the heat from her. Our granny is left with some choices. (1) She can move the dog out of the way. However the Earth cannot simply remove all the cloud and ice-sheets that surrounds it. Based on receiving on 70% of the energy being available the Earth’s average temperature can now be calculated as -18 oC. This means that most of the water on the planet, with the exception of water at the Equator, would be solid (ice) and therefore life cannot exist as it does now. Clearly this is not the case and some other process must be happening. (2) Granny could move closer to the fire but the Earth cannot move closer to the Sun at will. It does move over many thousands of years when it orbit becomes more circular than elliptical due to the influence of Jupiter’s gravitational attraction. This means that the average Earth-Sun distance will change. (3) Granny could put on a blanket to keep warm which is what the Earth does (figure 3). The Earth puts on a blanket of Greenhouse Gases. The Greenhouse Gases such as carbon dioxide take in infra-red energy by absorbing it when their covalent bonds stretch and bend. This is eventually released as heat energy warming the atmosphere. These and similar processes with other gases account for the Earth’s average temperature of 16 ºC. The take home message is that Greenhouse Gases are a good thing. Without them the Earth is too cold to support life as water would be a solid and not a liquid. However, having too much Greenhouse Gases is the equivalent of Granny having too many blankets on, she gets too hot and uncomfortable and that is not pleasant. This is why we need to reduce the Greenhouse Gases we are putting into the atmosphere from, for example, the burning of less fossil fuels, less deforestation and by using alternative energy resources.